When I learned about Dr. Martin Luther King Jr. as a child, I admired his discipline and restraint and marveled at how much his character was like Christ’s. I wanted to be like him. He was good, he was noble. He touched millions in the name for justice. As I grew older, I continued to admire Dr. King and the more I matured, his life’s actions inspired me to look at my own life and society. My friends and I began asking ourselves, what the civil rights movement of our day was. We would stumble to find the answer. We settled on saying it is hard to tell because racism in our time is covert. 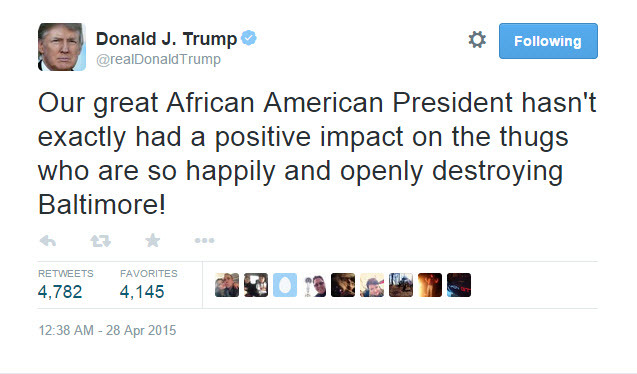 Now as I think and pray about Baltimore, I am wondering how true this statement is. Is racism covert because I didn’t then recognize racial micro aggressions? Was it covert because as a biracial woman, I am not always perceived as black and so do not elicit the same treatment as those that are ? Is it because I was able to attend good schools and live in a safe neighborhood? I am beginning to realize that my privilege made racism covert in my eyes. However, the most marginalized of our country have had to live with it overtly, blaring in their faces. Our nation’s lowest performing schools serve children both black and poor. There is despotism in these school system’s school boards, administration and hiring managers (some of who are not white). There is red tape that cannot be crossed in terms of resource allocation and hiring best practices. There are black and poor students who do not recieve a quality education because of systematic injustice. There are predatory lending agencies deceiving elders and causing them to lose their equity or homes, gentrification that raises property taxes and developers forcing residents to move from their homes to build new stadiums. Black and poor residents are seen as collateral damage. There are black and poor communities that have been in existence for generations that have waste and toxins dumped in their backyards by factories and plants. The community is then infected with disease. They call these communities cancer islands. There are black and poor communities that are not safe, nor stable for its residents. This racism has always been overt and systematic. There is nothing hidden about it. There are media outlets who will not cover peaceful protests as extensively as they do “riots”. 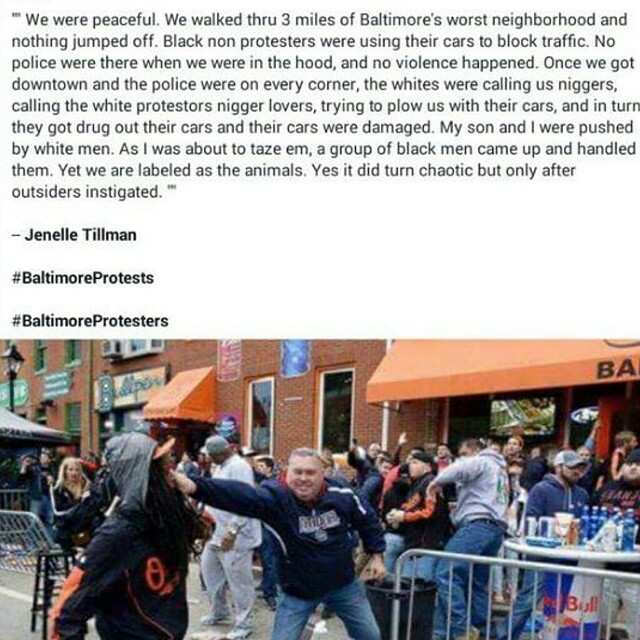 They do not broadcast how Baltimore residents marched peacefully through the streets of their city and had beer thrown at them and were called n**gers by white residents. Click image to watch full video or forward to 3:05 to see first hand account of antagonist disruptions during peaceful march. This is the same system that decided to demean the humanity of a murdered unarmed black child buying skittles and ice-tea (who was killed by a man who disobeyed police and acted from his own unfound suspicions) then to bring justice to him. Even in my generation, racism has never been covert. And then of course the most virulent of systematically racist systems; our criminal justice system. The system that will imprison black youth for petty crimes. But will sentence white-collar criminals to complete however many community service hours. This is the same system that is charged to protect and serve but instead stops and frisks. This same system is now becoming frequently fatal.The injustice at it’s hands has never been hidden but is only becoming louder. So now we see a swelling. A swelling of what we thought were covert tensions and nation-old realties as another murdered man is denied his humanity . This week that swelling has finally burst at the seams. As our youth who face very present racism everyday, in their schools, in their communities and with the police have finally exploded from the pressure. This explosion has not only caused unrest but revealed the disconcerting beliefs of some Americans. The heart landscape of America has not changed much since Dr. King’s era. There are many people who still do not see the humanity in black and brown people, and who do not seek to understand. This is not an excuse for our youth stealing or damaging property , nor is it condemning them. But more so, it is an examination of the cause and effect relationship of what is happening. 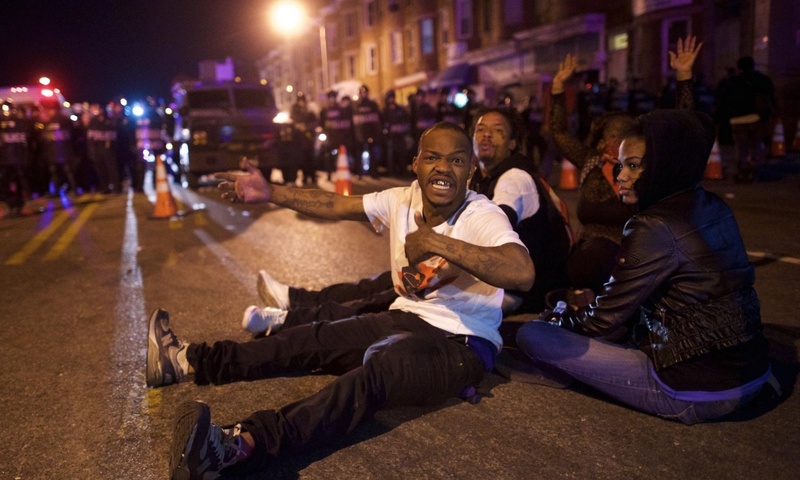 Freddie Gray died after being in police custody. There are no answers as to why or how. This recent death happened in the helms of countless others that have been killed by excessive force. This force seems to be reserved for black men and women regardless of class. 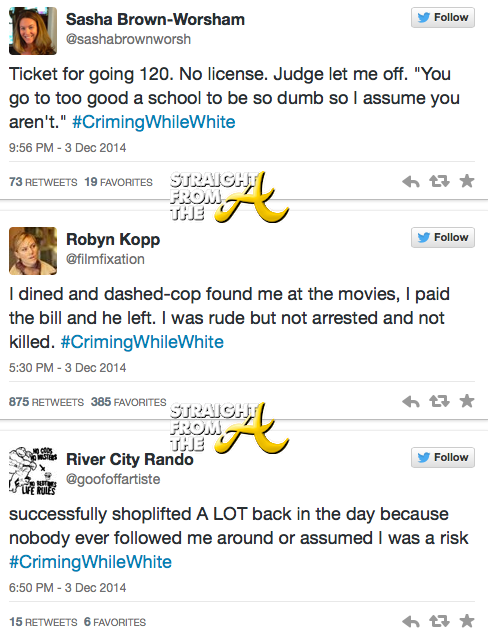 In contrast to how it seems white citizens are treated. 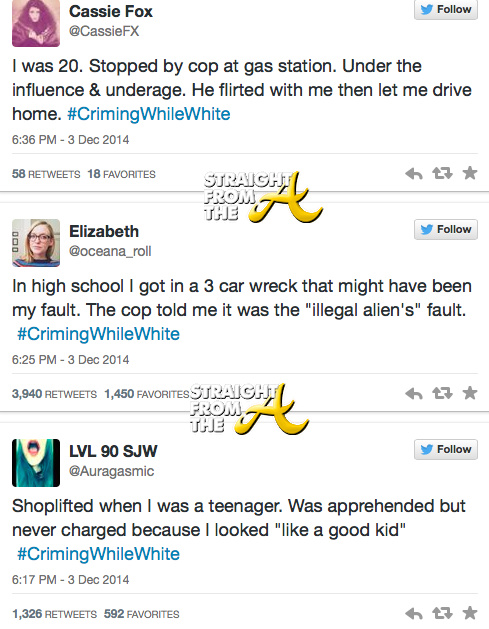 These tweets all used the hashtag #crimingwhilewhite, a show of solidarity. Lance Tamyo of San Diego pointed a gun at civilians and police officers. After an hour-long nonviolnet stand-off between Tamyo and police, Tamyo was still non responsive. He was then given an intentional non-fatal shot. 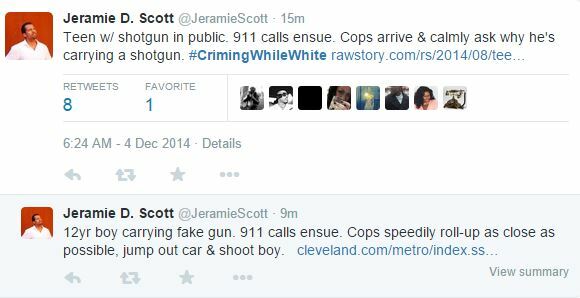 As opposed to Tamir Rice who was waving a toy gun and was shot and killed in his chest. Rice was 12 tears old. Click image to watch the video. These officers are overwhelmingly acquitted. This glaring reality along with the daily and very present realities of systematic racism is the cause. The effect is unrest. Some unrest sparks peaceful protest, other unrest sparks rage. This rage is what is getting most of the media attention. 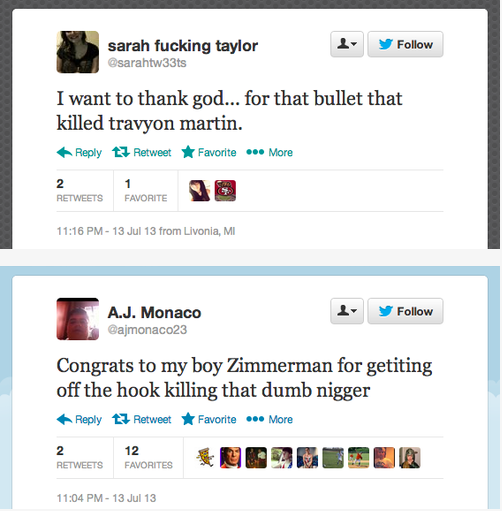 But if this rage did not happen, would our President call on our nation to conduct “some soul searching”? It is a human effect to an inhumane cause. Windows were shattered; items were stolen, but there were no causalities reported at the hands of these “rioters” other than people’s pockets. I am not saying it is right, I am not saying it is good. I am definitely not saying it is just… because the dozens of black lives that were killed at the hands of police officers are worth more than damaged property. I am saying it is an understandable effect of a violent system. 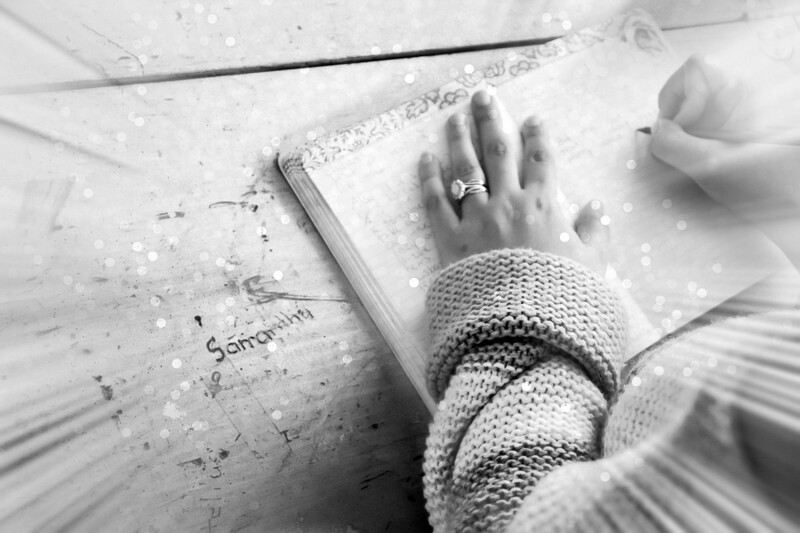 And I will search for solutions, personal responsibility and action in the shattered glass. I only hope our nation does the same.